Pat Hidson and Tori Tasch began their residency at Lynden with weekly visits to work together--this was their first collaboration--in the rough studio next to the barn. Hidson is primarily a painter and Tasch is a bookmaker and printmaker, but they shared a concern for the environment and a deep interest in the natural world. Over time, they began to focus on the birch grove next to Big Lake, a place where they could indulge their love of trees in proximity to water. 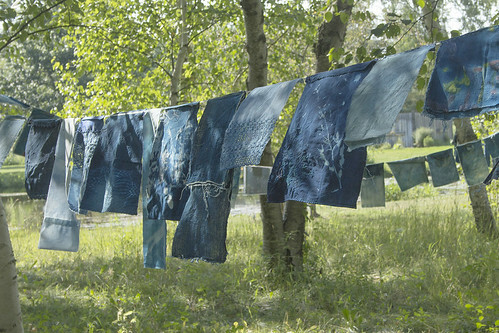 They gathered recycled cloth--evidence of the domestic arts women have practiced over generations--and began to make prayer flags using the cyanotype process. They used plants and other found botanical materials and exposed the objects to the sun to make photograms. Sewing, embroidery, transparencies and transfer processes borrowed from printmaking added layers and textures. 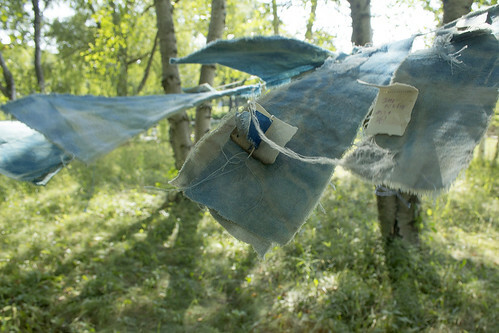 These flags, hung on a common cord, have been slowly accumulating in the grove, an offering, according to Hidson and Tasch, to honor both the spirit of the trees and the hearts of those who visit the birch grove: "The tradition of using prayer flags to express the connection between the human and the divine is very ancient and crosses many cultural divides." Throughout the project, Hidson and Tasch have invited the public to join them in making flags, learning processes, or gathering wild seeds. They began on our 5th anniversary, last May, by leading a workshop on botanical prints and were at the free family days in July and October making flags. They will be in the birch grove on May 15 for Kites Over Lynden, helping us all make cyanotype tails for our recycled plastic kites. Going forward, the artists will be working with text--quotations, poetry--and shifting their focus to animals. Ultimately, they would like us to recognize the entire outdoors as habitat, and to encourage us to nurture the earth. Pat Hidson was born in Edmonton, Alberta. She began her art training with her artist grandmother, Dorothy Ryland. After attending many years of art classes at the Edmonton Art Gallery, she was fortunate to have a marvelous high school art teacher, Mrs. Darevich, who inspired her to attend the University of Alberta. Hidson planned to be a high school art teacher, but after her third child was born here in Milwaukee she began to do pastel portraits to make money to support her art classes at MIAD, as well as trips with the children. Many exhibitions later she has still not gone back to that teaching career, but sharing her skills with generations of adult students in her studio has been a joy. Tori Tasch is a mentoring artist at RedLine Milwaukee (where she has a studio), an art educator working with K4-8th grade, and a printmaker who maintains a vibrant studio practice. She serves on the board of Milwaukee Area Teachers Of Art, and is the Southeast Exhibitions Chair for Wisconsin Visual Artists. Tasch lives in Merton with her two dogs and husband of 30 years.